The SEMI Interface A, also known as Equipment Data Acquisition (EDA), standards are a collection of SEMI standards to improve and facilitate communication between IC Maker’s data gathering software applications and the factory Equipment. SEMI E120 provides a general object model that represents an external view of Equipment. The model is composed of various classes organized in a logical hierarchy. A fully-implemented model summarizes all of the Equipment's major hardware and software components. SEMI standard E120.1 XML Schema for the Common Equipment Model (CEM) maps the E120 standard into a specific XML implementation. 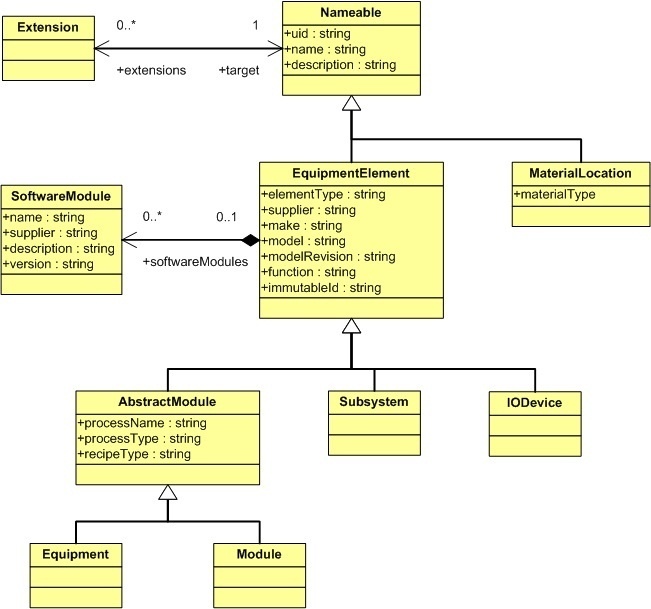 Equipment Models the equipment as a whole and contains MaterialLocations, Modules, Subsystems and IODevices. Module Models a major equipment subsystem that can process material like a process or inspection chamber. It may contain MaterialLocations, Modules, Subystems and IODevices. Subsystem Models a major equipment subsystem that cannot process material like a load port or prealigner. It may contain MaterialLocations Subsystems, and IODevices. IODevice Models sensors, actuators or intelligent actuator or sensor devices. MaterialLocation Models the ability of an equipment component to hold material, specifying the material type as Carrier, Substrate, or ProcessDurable. SoftwareModule Describes the existence and version of software that is in use on the equipment and on equipment components. The software might be supplied by the equipment manufacturer or a third party. Attributes identify the supplier, version and a description. EquipmentElement The basic information required for each hardware component, such as an AbstractModule, Subsystem or IODevice. Attributes identify the supplier, make, model, role, revision, and (if applicable) serial number. 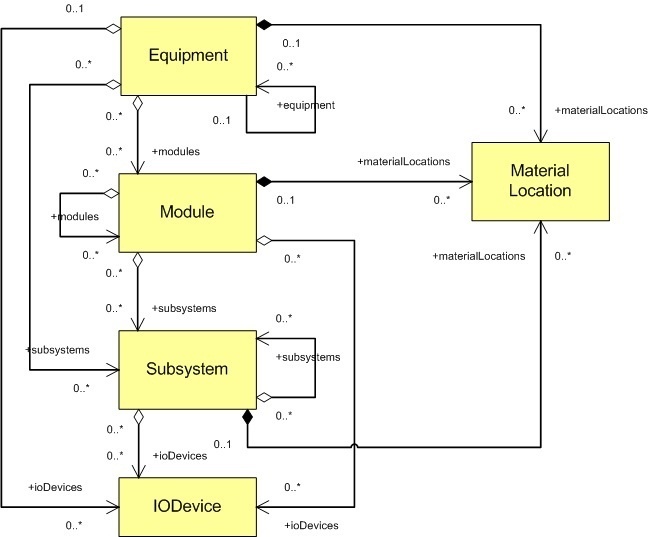 AbstractModule A subclass of EquipmentElement that models the parts of the equipment structure capable of processing material; namely Modules and Equipment. The attributes specify the process type as Measurement, Process, Storage or Transport and specifies the recipe type. Nameable The root of every class to provide unique identification and a description for each component. Extension Provides the ability for other standards and specific implementations to extend the CEM.